Lehigh Valley and The Pocono's best choice for inflatable attractions, carnival rides, games and all things fun! Thank you for visiting Metz Amusements and Concessions; Lehigh Valley and The Pocono's best choice for inflatable attractions, carnival rides, games and all things fun! Here you'll find great deals on bounce houses, bounce & slide combos, interactive games, and so much more. We're located in Northampton County in the slate belt area which borders the poconos and lehigh valley. We offer delivery to Allentown, Bethlehem, Easton, Stroudsburg, East Stroudsburg, Tannersville, and most anywhere in Northeast Pennsylvania to include Northampton County, Lehigh County, Monroe County, Berks County and other nearby counties. IF YOU DON'T SEE YOUR CITY, JUST GIVE US A CALL AS WE STILL MAY BE ABLE TO ACCOMMODATE. Metz Amusements & Concessions LLC. Bounce house rentals are taking the world by storm. People often don't know what to call them though: bounce house, moonwalks, jumpers, bouncers, bouncy house, jump house or even a kids party inflatable thing. We call them fun and we have a great selection of inflatables with all of your favorite characters and many different themes to coordinate your event. Who wouldn't want to make their children's birthday party the best on the block. 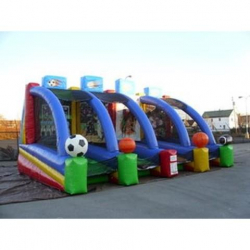 These are popular for block parties, church and school events, and for any function where you have children who like to jump and bounce! We also have inflatable slides and water slides. 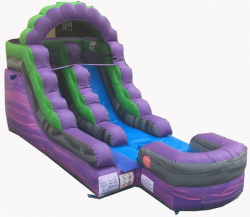 We have inflatable slides for younger children but also 22' high slides for the older, more daring, children and young adults. We have an inflatable tidal wave water slide that's new for this season. 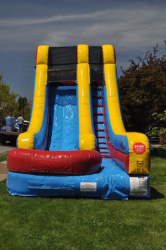 Water slides are a must have in the summer months for those graduation parties, family reunions, church events, and just for some backyard fun! Our obstacle courses range from 30' to 64' in size. We also have Playtona that's an obstacle course for younger children who can race through the inflatable obstacle course to see who can get through the fastest. Our larger obstacle courses are a hit for high school and colleges where the course can be quite a challenge for some. Consider an inflatable obstacle course for your next graduation party. Our carnival games are a great addition to your event with those bounce houses and inflatables. We have many sports themed inflatable games such as Quarterback Blitz, Full Court Press, Skee-ball as well as mini basketball, baseball, and football. We also have number and holiday/month wheels. Check out the many games using bean bags that can be used for all ages. No party is complete without a few games! And YES, we do have dunk tanks! Our dunk tanks can be delivered or a customer pick up just as long as you have a 2" trailer mounted ball. Dunk tanks are hit for any event. We also have a Pitch Burst which is not quite a dunk tank but will certainly still get the one in the hot seat very wet! Dunk tanks and water games are certainly a hit at fundraiser events! Our tents, tables, and chairs are a necessity for those backyard parties. With birthdays and graduations and even weddings, we offer several size tents, several table and chair options, and we also have tent lights and walls that can be added to our tent packages. We offer concessions including: popcorn machines, sno-kones, cotton candy, hot dog rollers, and other items to complete your event. So whatever you want to call them; bouncers, bounce houses, bouncy house, jumpers, inflatable things etc...give us a call or you can reserve on-line and we promise a great time!